Welcome to our Koi For Sale page! 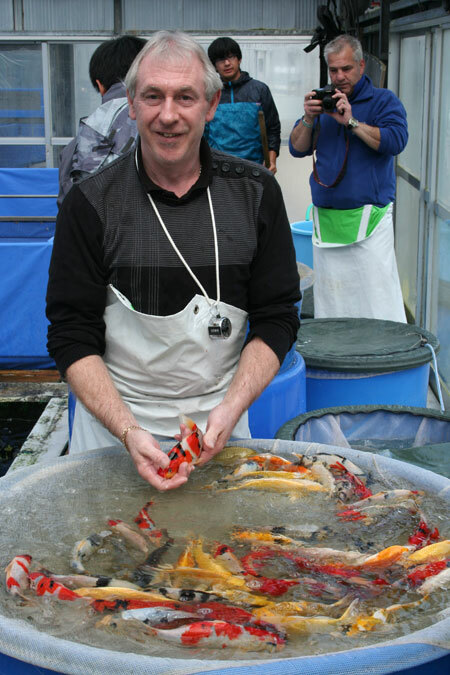 The majority of our koi come from Ogata Koi Farm where Neil visits on average 3 times a year. He hand selects every piece himself from stunning 2 year old koi right down to the smallest tosai(one year old koi). 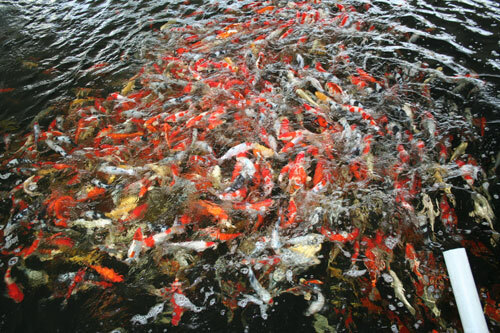 Over the last 10 years we have supplied many show winning koi from Ogata Koi Farm! 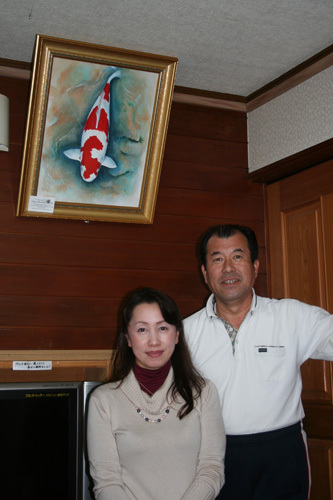 See our page "10 years of Dock Koi"! We now also have the opportunity to select from Ueno Koi Farm, Okawa Koi Farm and Suetsugu Koi Farm where we can obtain superb showa, sanke and kohaku! Just recently Neil has been to visit Ueno Koi Farm who breeds some fantastic showas and he has already been tempted to buy some 2 year olds! These will be on display in the main pond and are approx 55cm each. Neil at Mr Ogata's Koi Farm. All our koi are quarantined for approximately 6-7 weeks to ensure that they are healthy and disease free so that you can buy with confidence! During this period certain koi can be reserved with a non-refundable deposit pending completion of the quarantine period. Although we prefer you to collect your koi in person, you can opt to have it delivered by courier which usually involves a late pick-up one day with a delivery before 10am the following day. This normally costs £25.00 per box. Your koi will be double bagged with oxygen and packaged with the upmost care to ensure a stress free journey. However once it has left our premises all risks must pass to the purchaser/receiver.